UK Defense Secretary Michael Fallon resigned on Wednesday evening after an allegation of inappropriate conduct, saying his behavior may have "fallen short." The Tory MP is the first British politician to resign amid the growing Westminster sexual harassment scandal. 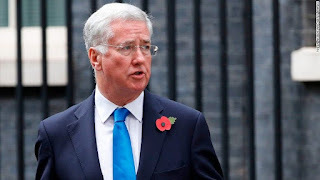 In a statement, Fallon said: "In recent days allegations have been made about MPs' conduct, including my own. "Many of these have been false, but I realize that in the past I have fallen below the high standards that we require of the armed forces, which I have the privilege to represent."